If you only ever read one dog biography in your life, make it this one. There you go, publishers: there’s your free blurb. There wasn’t really a good reason for me to pick this book up – I was vaguely aware of Rin Tin Tin but didn’t know much about him besides the fact that he was a movie dog during the 1940’s (this is only partially true, it turns out, but we’ll get to that). I had two reasons for wanting to read this book. First, it’s by Susan Orlean, who could probably write an investigative story about the time she watched paint dry and it would be riveting. And secondly, I just really like dogs and reading about the people who love them makes me happy okay. Rin Tin Tin was more than just a movie dog. In fact, he wasn’t a single dog at all, but several generations (and possibly several unacknowledged stunt dogs – Orlean addresses the controversy surrounding Rin Tin Tin and whether there was only one dog acting in all the movies or if doubles were used, although she doesn’t really come to any conclusions). The legend of Rin Tin Tin can be divided into eras: the original Rin Tin Tin, who was found as a puppy on a battlefield in France and acted in silent films; his grandson Rin Tin Tin, who acted in the TV show The Adventures of Rin Tin Tin in the 1950s; and further down the line, the later Rin Tin Tin who was used for publicity when the show was brought back in the 1970’s. In between are the many offspring of the original Rin Tin Tin and the various people who loved the dog in all his forms. Orlean’s book is more than just the story of a famous dog. When talking about the original Rin Tin Tin, you also learn about the use of dogs in warfare (during WWII, families who volunteered their pets for service would get updates on their dog’s training progress, and animals who survived the war were returned to their owners) and the history of the German Shepherd breed. When Rin Tin Tin starts working in Hollywood, Orlean explains the origins of the movie industry and how the creation of talkies led to the end of the first Rin Tin Tin’s career, and how television was able to bring him back. This is not just about a dog and the people who loved him. It’s about warfare and propaganda, and the history of movies and television and how those mediums have changed over time. But most importantly, it’s a story of the connection between people and animals, and how the love for one dog was able to span decades. 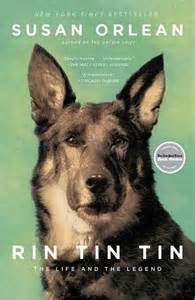 “I believe there will always be a Rin Tin Tin because there will always be stories. He began as a story about surprise and wonder, a stroke of luck in a luckless time, and he became a fulfilled promise of perfect friendship; then he became a way to tell stories that soared for years. He made people feel complete.